81318 Private Ebenezer Bradley, 1st Battalion, West Yorkshire Regiment (Prince of Wales’s Own) died of wounds 24 October 1918 and is buried at Premont British Cemetery. He was 25 years old, unmarried, the son of Edwin Stobart and Linny Bradley. The family lived at 11 Mayfield Terrace, Cockfield. Ebenezer worked as a miner at Gordon House Colliery. 51598 Private John George Dowson, 1st Battalion, East Yorkshire Regiment was killed in action 11 September 1918 and is buried in Honnechy British cemetery, France. He was 19 years old, unmarried and lived with his father Joseph and step-mother Kate Dowson at Fell View, Cockfield. 24712 Private Moses Hammond, 2nd Battalion, the King’s Own Yorkshire Light Infantry was killed in action 3 April 1917 and is buried at Savy British Cemetery, France. He was 20 years old, unmarried, the son of Thomas and Elizabeth Hammond and lived at 13 Mayfield Terrace, Cockfield. 66570 Private John Joseph Burrell Hutchinson, Machine Gun Corps (Infantry) died of wounds 10 June 1918 and is buried in Cockfield cemetery. He was 20 years old, unmarried, the son of John and Sarah Hutchinson. The family lived at Peth Row Farm, Cockfield where John worked as a farmer. 388253 Private Bertie Kirby, 2nd (Northumbrian) Field Ambulance, Royal Army Medical Corps died 1 October 1918 and is buried at Sarigol Military Cemetery, Kriston, Salonika, Greece. He was 25 years old, unmarried and lived at 7 Mayfield Terrace, Cockfield with his parents Thomas and Annie. Bertie worked as a coal miner. 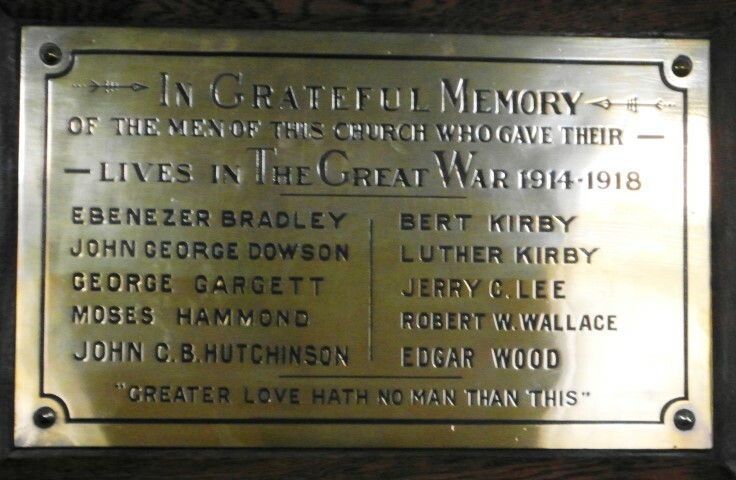 51653 Private Luther Dixon Kirby, 21st Battalion, the Manchester Regiment was killed in action 24 October 1917. He has no known grave and is commemorated on the Tyne Cot Memorial. Luther was 26 years old, the son of James and Jane Kirby and married to Sarah (nee Bowman). 3666 Private Jeremiah Cameron Lee, 6th battalion, the Durham Light Infantry, was killed in action 1 October 1916 and is buried at Warlencourt British Cemetery, France. He was 23 years old and married to Mary Jane (nee Corner). They lived at 13 Jubilee Terrace, Evenwood. Jeremiah “Jerry” worked as a coal miner. 3974 Private Robert William Wallace, 1/6 Battalion, the Durham Light Infantry was killed in action 1 October 1916. He has no known grave and is commemorated on the Thiepval Memorial to the Missing of the Somme. He was 22 years old, unmarried and lived with his parents Robert and Margaret Wallace at Front Street Cockfield. He worked as a coal miner.